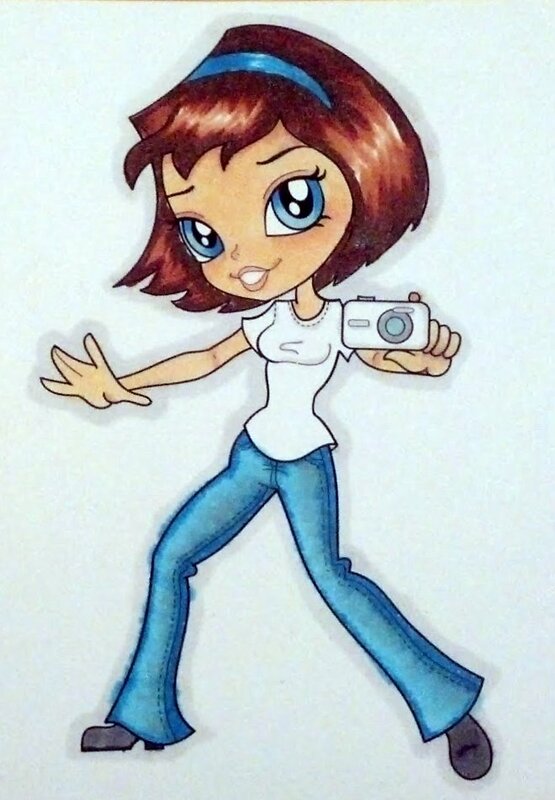 This is one of the five images I bought from her... of course... after reading her "An Idea" post, I HAD to have all five... not all at the same time... she keeps adding. :) As of this post, she has five images... she's new to the digi world... and because of her post... I DO have all five. :) Besides... even if she didn't have that idea, I'd still buy these... they are wicked cute! I've shown you Honey... now I'll show you Photographer. Isn't she darling? 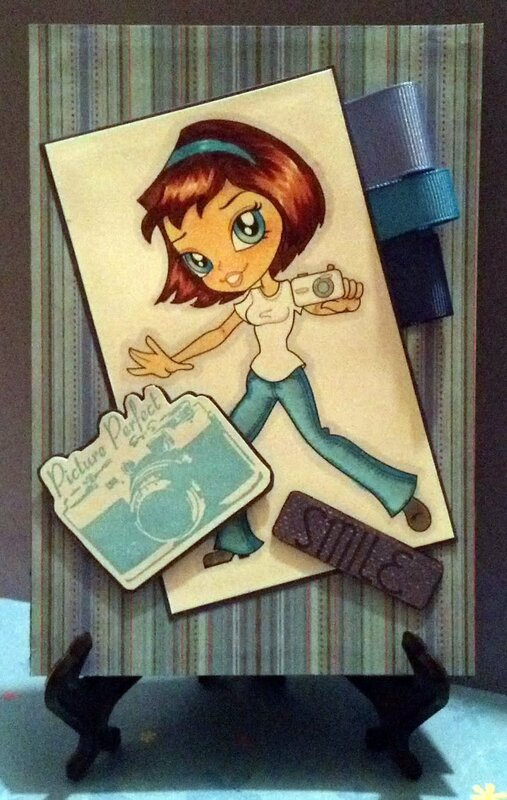 I had to pair her up with my TPC Studio Cling Retro Stamp Set. 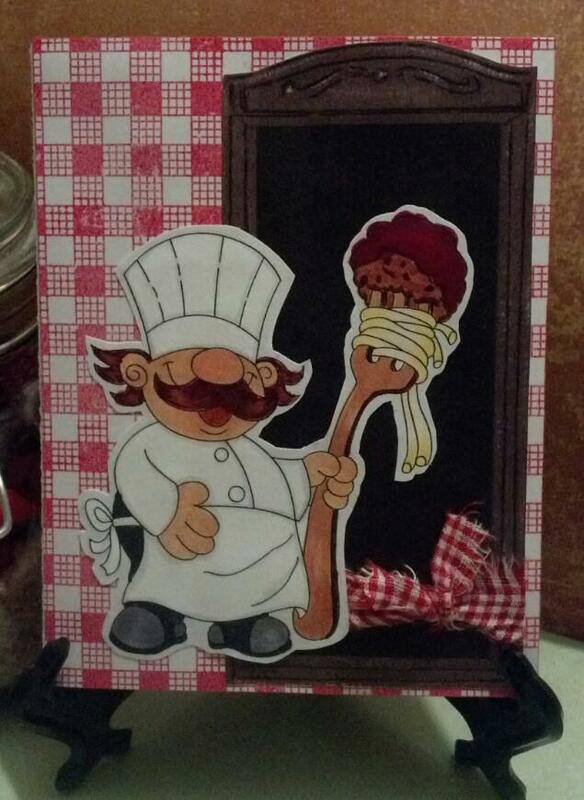 I used card stock, ribbon, printed paper and chipboard from my stash. I've always wanted to do one of these angled image cards... and just as I suspected... I keep wanting to straighten it. lol That is what had been keeping me from doing it before now but I still like how it came out. What do you think? 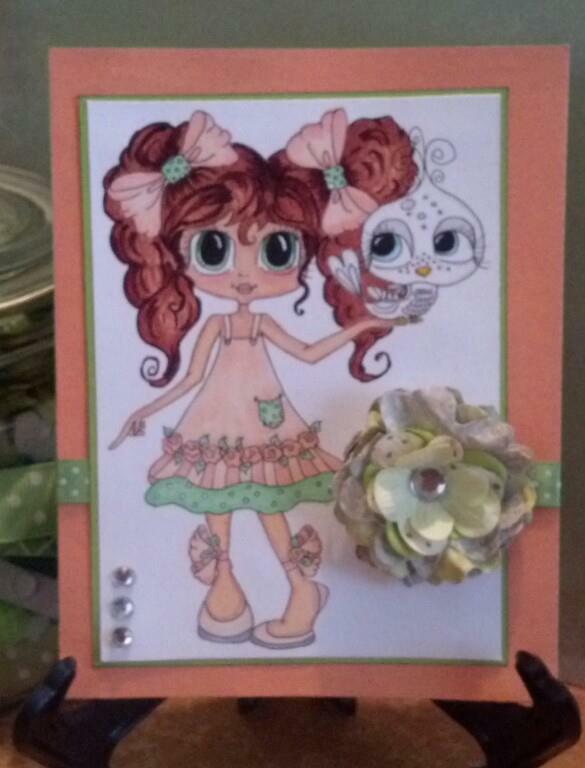 Whimsie Doodles picked this card as one of the TOP 3 for December 2012! 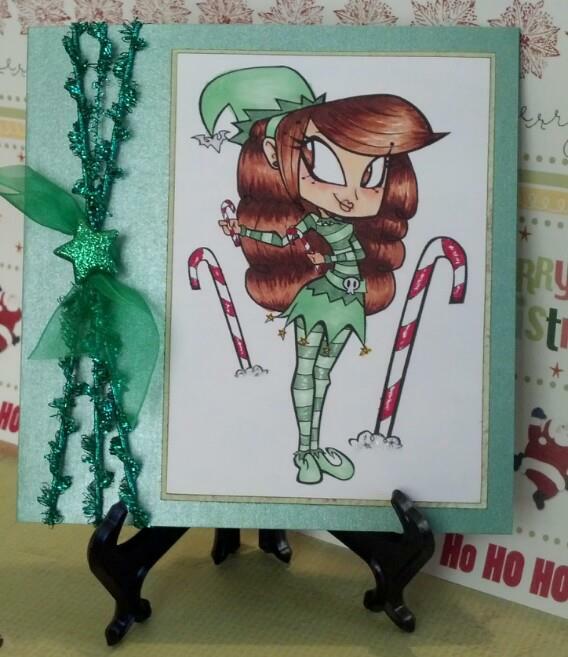 So the card stock and ribbon are from my stash. 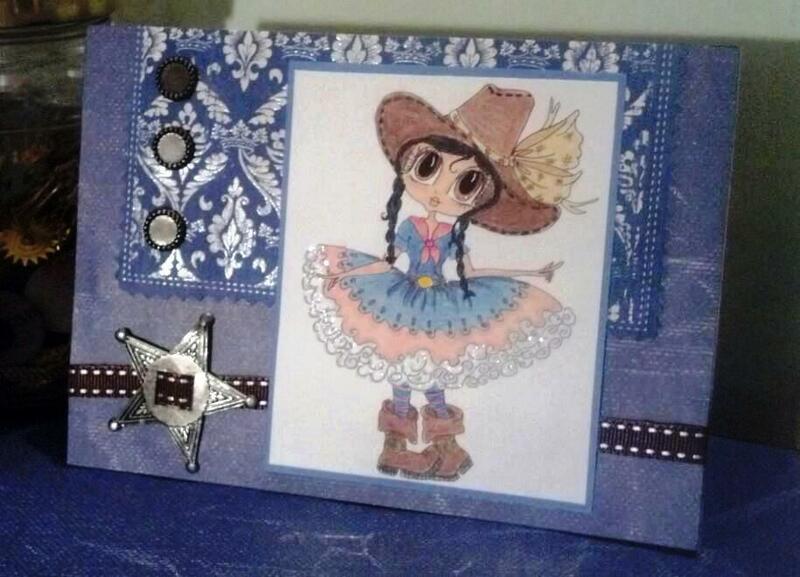 I used Spellbinders scalloped circle nestabilities and labels. 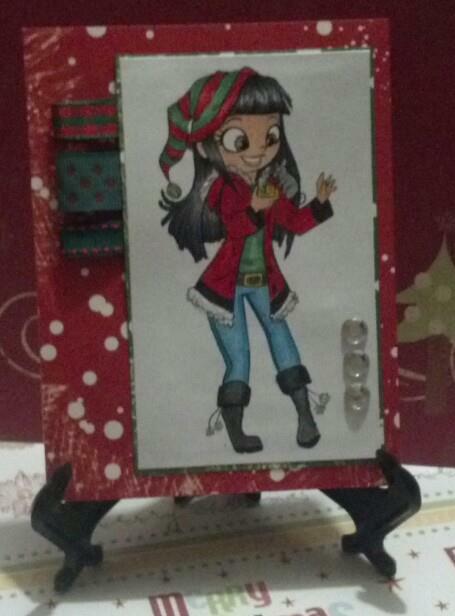 The printed paper is Make Merry - Celebrate by Michelle Coleman from Fancy Pants Designs. Yes... 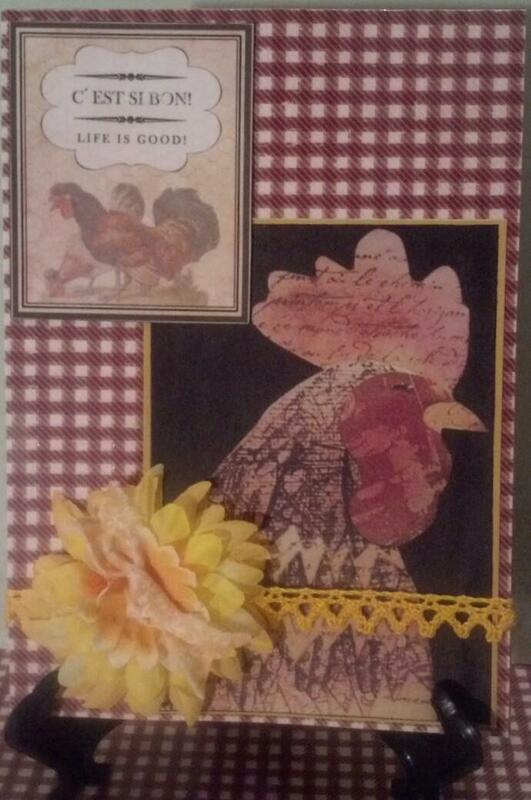 I thought I was ALL DONE with the seven chicken cards I needed for the swap over on FB I've written about before. Wellll.... I took the cards over to my mom for her to have a look see... she LOVES chickens and roosters... collected them in her home for years! 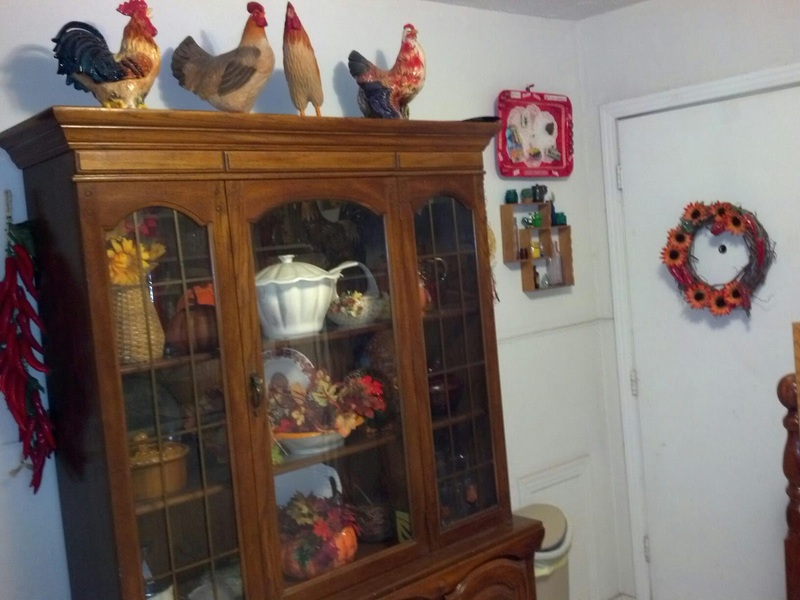 When I inherited her belongings I inherited many, many chickens and roosters... over the years I downsized the collection. There were just too many! I've kept a few I love... they blended well with my own collection of sunflowers, chili peppers and the warm fall colors I love so much... reds, oranges, golds... here... I'll show you! I know! Kinda busy, huh? Don't know where to look first? I love it! I read an article online of an artist who surrounded her work space with things she loves. Having been diagnosed with leukemia changed a lot for me. I reassessed all that I owned... I have kept only the things I absolutely love... and I don't have much in storage. If I love it... it's on display. If you look closely, in the picture above, smack in the middle of the picture on the top shelf next to the red pail, there's a Halloween ghost. 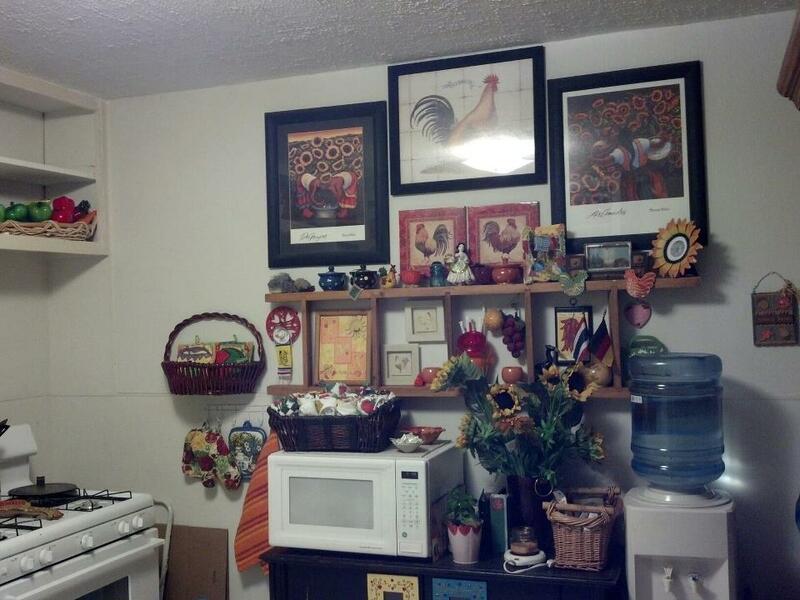 :) lol In the picture above that, if you have a closer look, there are fall items in the china cabinet. I love it. I get to see it every day. :) By the way, as you can see... my kitchen is TINY! But it's mine! I became a home owner this year. I can do as I please with my house... and I have. The very first thing I did... 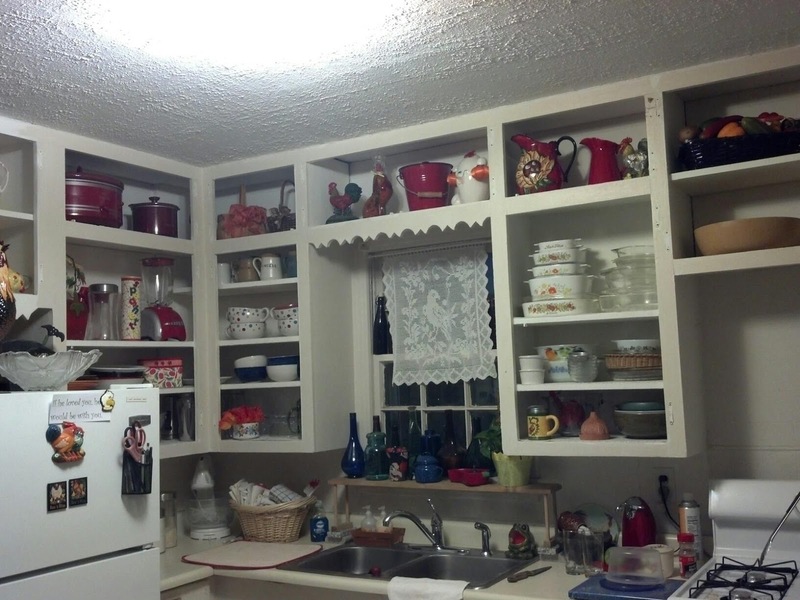 I removed the doors to the cabinets! :) lol I. LOVE! How. It. Looks! I do! I love how it came out! For once... it looks just like I "Ema-gined" it! ;) lol I. Love. This. Card! I hate to give it away! :-\ I hope the recipient loves it as much as I do. Then... I had one more image I found and loved... aren't these the cutest love birds ever! Except... they aren't love birds... it's a rooster and chicken! I thought it was too cute! 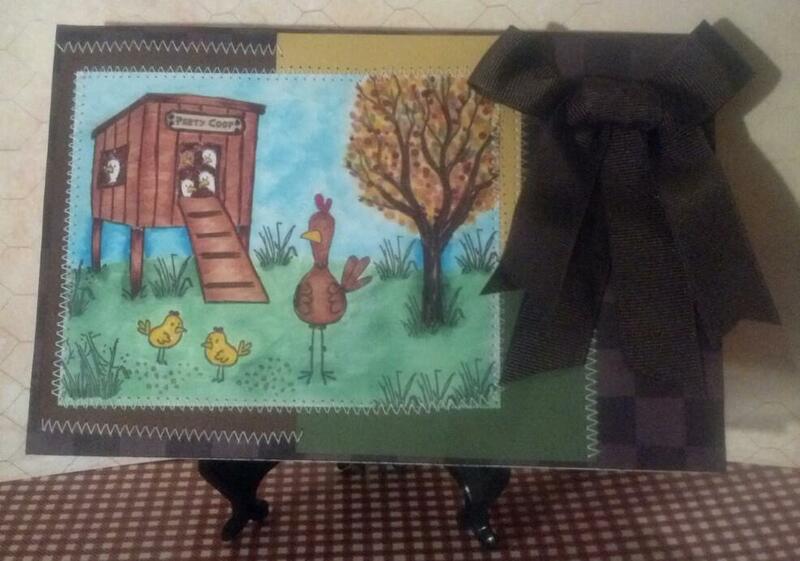 It's an image I found at Coloring Page Tuesdays by Elizabeth O. Dulemba called ever so appropriately... Love Chickens! Don't you just love that!?! All the card stock, ribbon, brads and leather flowers were from my stash. I used Spellbinders heart nestabilities and the printed background and little label are from the Rooster Provincial paper pad from Hobby Lobby. 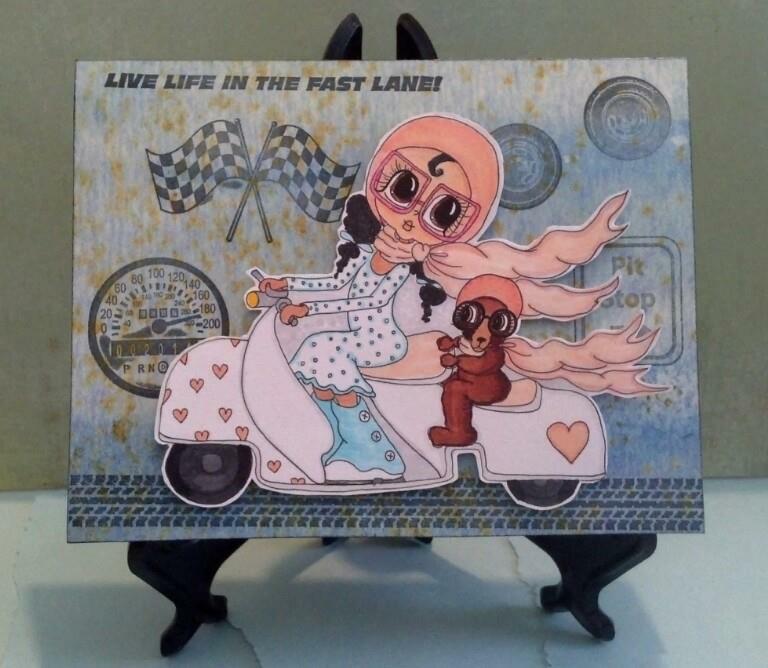 This is Girl Friends Forever from Scrapbook Stamp Society... an absolutely adorable image! Reminded me of a friend's daughter, Amber, up in New Hampshire and I decided to make her a pop-up canvas for her room... I called my friend, Donna, to ask about Amber's favorite colors and activities. Her favorite colors are pink and green and she loves to chase butterflies... so naturally! Amber is 7 now! I'm always amazed at how people change and age as the years go by... I know I change too... but I don't age... NOPE!! ;) I haven't spoken to Donna in over a year! We do communicate almost weekly... via email or an occasional text... but rarely by phone. Last time we spoke by phone was right after I emailed to inform her of my leukemia diagnosis. She called when she read my email and we spoke for hours on the phone that day just as we did when I called her this last time. What I love about my friendship with Donna is that we can go months without speaking and when we finally speak again... we pick up right where we dropped off and spend hours catching up. She's not ever told me she doesn't have time to talk. Whatever she was doing when I called... is not ever as important as speaking to me. I love her for that! When we lived in NH, she included me in all her family gatherings and did not ever make me feel like I was a third wheel. Maybe that is because she also invited all her other single friends and there were way too many people to feel like the odd girl out. God bless my dear friend, Donna. Doesn't it make you think of spring? I love how she looks like she's nestled into the flower. I've had enough cold weather... what is it? Eight days into winter... :-\ ... I think it's going to be a long winter for me! Hope you are keeping warm! 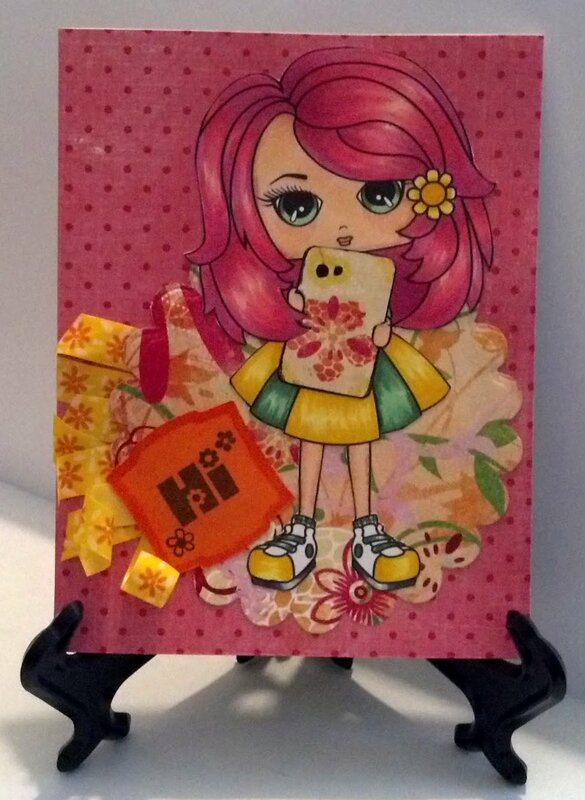 I used an image from the Pretty Pet Besties series Tiffany and Squeek from Scrapbook Stamp Society. 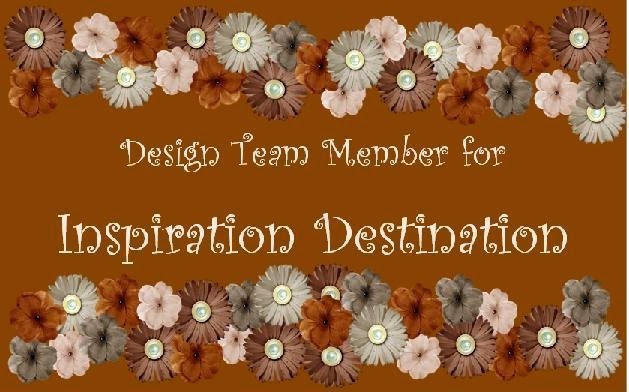 I made the flower with Design Tool #1 template from Hot Off the Press... by the way... I. Love. This. Tool! I use it all the time! 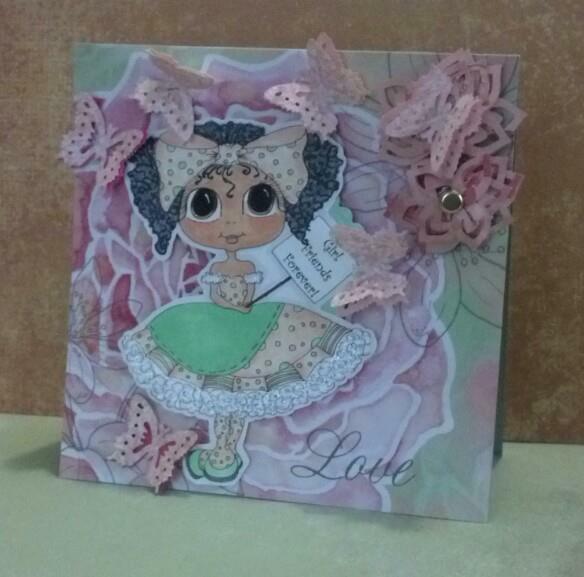 I can make flowers, butterflies, labels... it is awesome! ... I added pre-made flowers to the center to add some fluff to the flower and a rhinestone for the center. I wanted a big fluffy flower and I think I accomplished that. 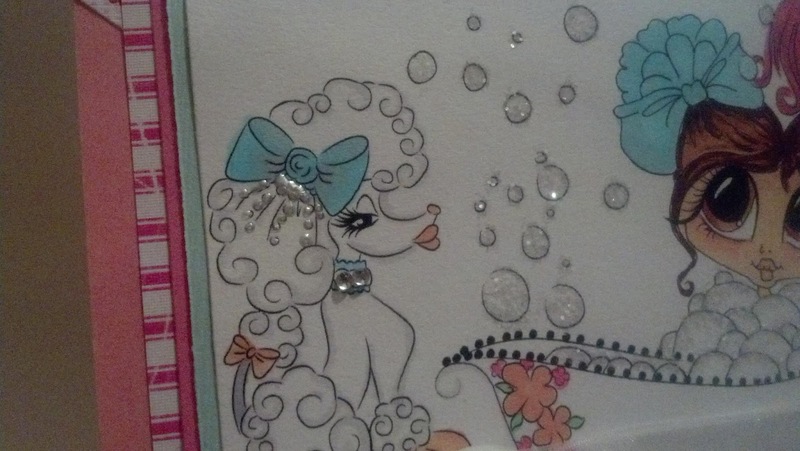 The rhinestones on the left of the card and the one in the flower are from Michael's $1 bin. 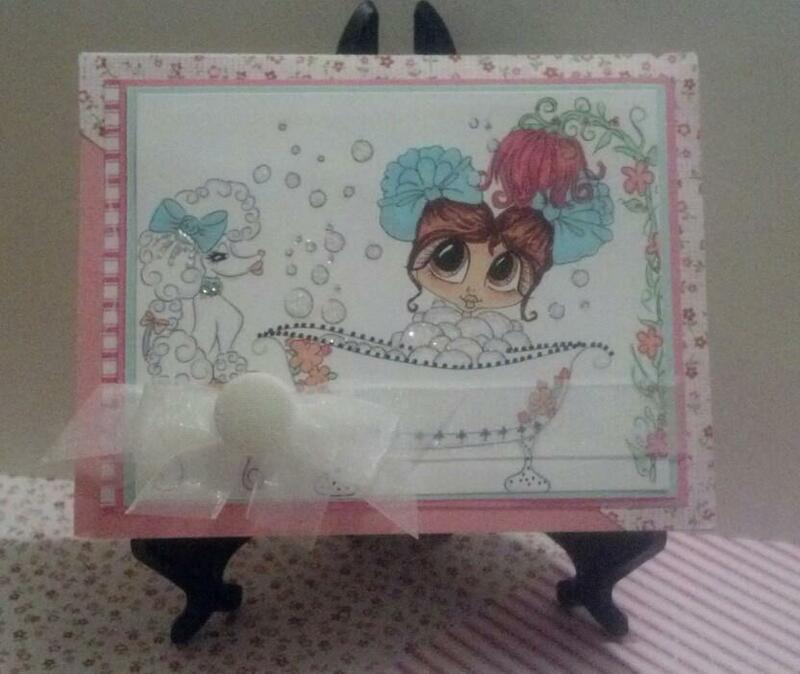 Ribbon, card stock and paper are from my stash. Copic markers were used to color the image. The bird reminded me of a pet cockatoo a friend adopted in high school. 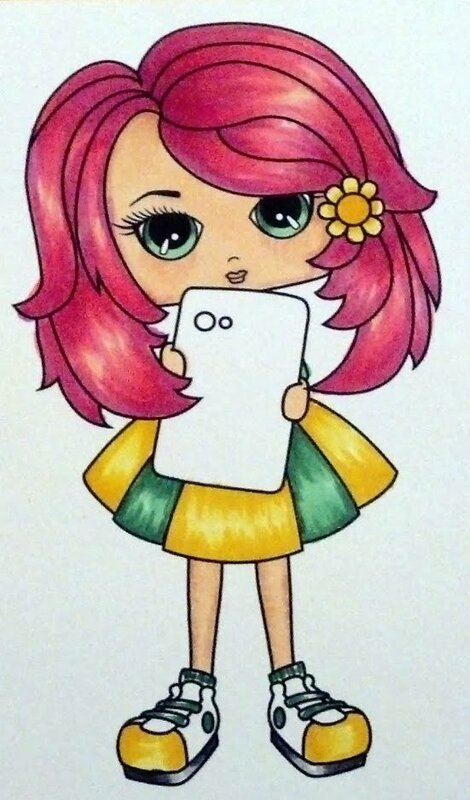 Isn't this a cute image?!? Let me tell you... 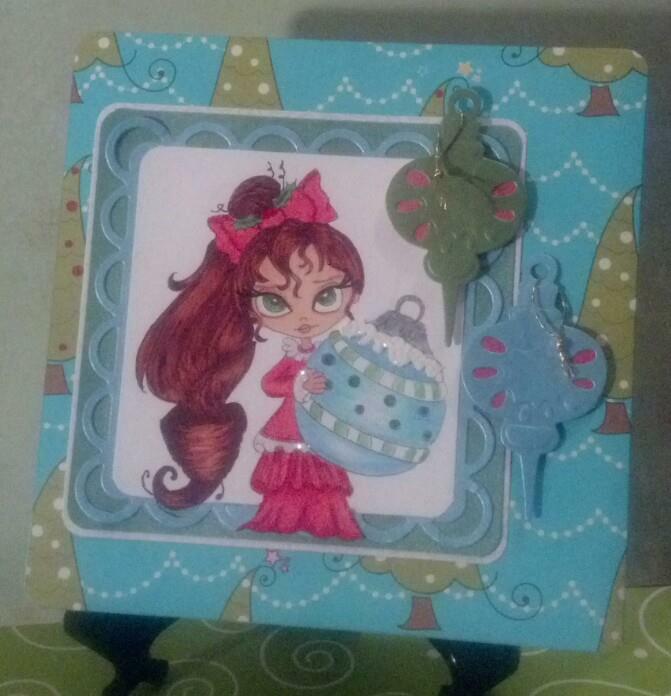 I almost didn't go to Christmas At Sweet Stampin' blog to look into their challenge... I am so done with Christmas cards for the year 2012. I did go have a look see... and what a relief! They are having an Anything Goes Challenge! :) Yay! Ready for some warm weather now? Driving back from New Hampshire... All. By. Myself... over 2,000 miles... All. By... :) In case you'd forgotten already! ;) There were many thoughts that ran threw my head... I'd already survived the November 2009 automobile accident I posted about back in November 2009... makes sense huh? :) So there were many, many things I contemplated on the long drive... which by the way... was four and a half days because I wanted it to be four and a half days. :) So I think I arrived with my head screwed on a little better than it had been before... and my head was screwed on a little bit better after the accident... now... I was diagnosed with leukemia AND am in remission... I think my head is screwed on even better! I'm wicked awesome... AND... I'm sprinkled with glitter! ;) lol I read that somewhere... so me! :) But I'm getting off the subject... what I wanted to point out is that on the drive back... through many states... I saw lots of majestic beauty the Lord has given us... if I had to summarize the rolling hills of broccoli... the fields of gold as far as the eye can see... the background paper I chose to use summarizes it for me... because I couldn't. I write the rolling hills of broccoli... the fields of gold... because this is what I was reminded me of... what I drove through were the rolling hills of evergreens through the northeast... the gold were the fields of wheat across the central states... Majestic! I tell you! It made me wish I was a poet. :) What I got out of this experience... I AM a strong woman... I can do anything I want with my life... AND... I can do it alone if I have to. Second, is the image of Pretty Pet Besties Halie and Harley from Scrapbook Stamp Society reminded me of a dear beloved brother-in-law, Clyde, who passed away recently. Get this... my sister, Lilly, and Clyde along with their daughter and her husband... went to the watermelon festival in a nearby town on a Saturday. He stopped to buy a snow cone... then he tripped over a mini hay bale used to control foot traffic. Hit his forehead, suffered a sort of whiplash injury, was taken by ambulance to the nearest hospital, transported back to one of the huge hospitals in our city, was scheduled to have an operation to "fix" the whiplash, his kidneys and liver started failing... but Lilly was given hope... put Clyde on life support and have a PICC line inserted for medication that would improve his condition for the surgery. So she signed the necessary forms... I went to the hospital to see him but was unable to... only got to visit with Lilly. Clyde was having the PICC line inserted when I arrived. He passed away after that procedure... NOT because of the procedure... his kidneys and liver failed and he slipped away. I should point out... he was a large man... over 6' tall... and a wide body... I couldn't even begin to guess how much he weighed but there are pics of him on my blog... big man. I wouldn't want someone to go away thinking PICC lines are dangerous. I had a PICC line when I was hospitalized with the leukemia. He didn't die from the PICC line... he died because of his failing health. The accident only contributed to it in that it brought the death on quicker. He'd not been well for a few months. He was struggling to get through life. I think death gave him peace. He may not have wanted it... I completely understand that. I don't want to die either... but I also know... I would go be with our Father... I've had a hard life... I'm ready to go home. I don't know if Clyde was ready... I hope that he was and that he has peace now. So do just that... live life in the fast lane! :) Make every second count!! 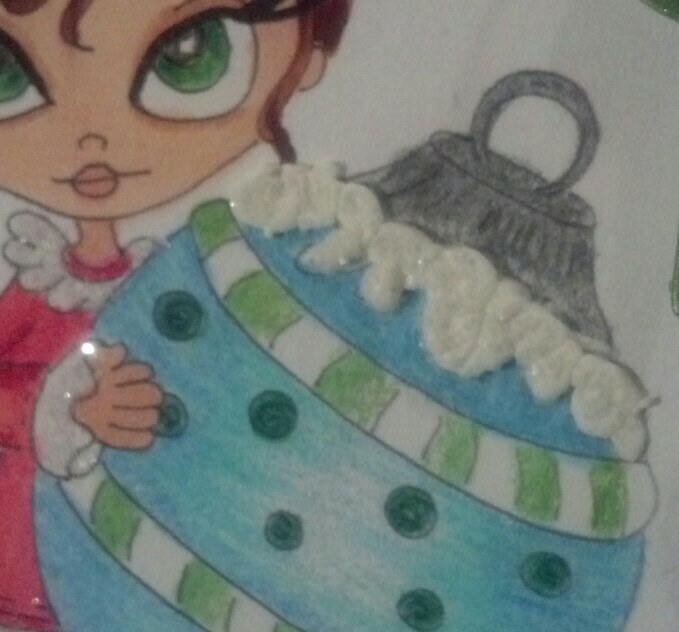 This one is from Some Odd Girl and what appealed to me ever so much... it was not Christmas themed! :) I am all Christmassed out... if that is such a word! I've been making Christmas cards full time since late October... not to mention the occasional Christmas card I've made here and there since last Christmas and before October. I do this every year... I send out about 60 Christmas cards so I work on them all year long and kick it into overdrive about... usually November... sometimes October. Every year I tell myself... this is the year I will be done IN October... hahahaha... tickles my funny bone each time I think that. :-\ Realistically... if I made six a month... give or take... I could do it. This year... I discovered challenges... some with prizes! To remove any doubt read my post from yesterday... I was a winner! :) But since I discovered challenges in December... naturally... the majority of them are Christmas themed. 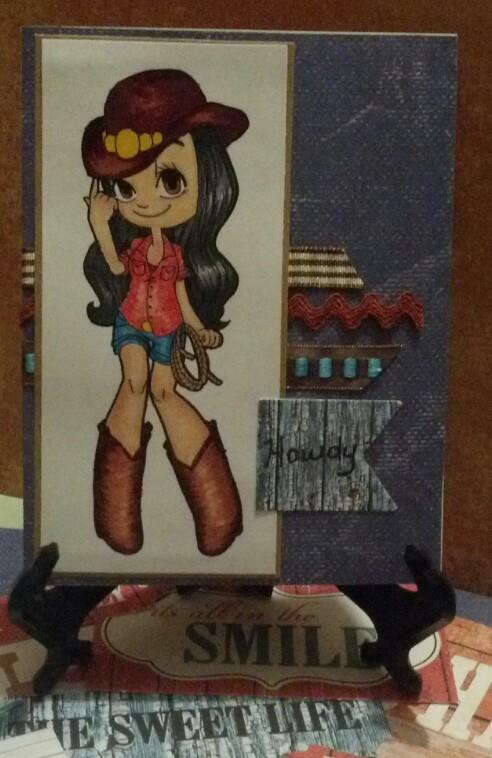 The prizes are all the ammunition this little Texas girl needs! Going back to this particular December Challenge. I've made myself homesick for New Hampshire. I was born and raised in Texas. I've been fortunate enough to move around. I've lived in three different cities in Texas... one large, one tiny and one medium-size a little big for its britches... we also lived in Connecticut, Colorado, New Mexico and New Hampshire. I finished raising my children in New Hampshire. They consider it home and so do I.
I didn't move around because I was running from the law... I didn't have a spouse in the military... I was not in the military... I... was... a single parent... always chasing the mighty dollar. I didn't move my little family thousands of miles from home because I was bored with my surroundings... each and every time... I was offered a position that would pay thousands of dollars more than I was currently earning and all I thought of... was about the things this would allow me to provide my children. I'll be truthful here... we moved to New Hampshire in May 2002... my children were 14 and 16... I was... exhausted! I'd moved our little family 2,000+/- miles from all we knew... I was tired of making all the decisions all of the time. What was I to do? Despite all that... my children did see parts of the USA not everyone gets to see or experience. We went to several beaches on the east coast... trust me... not all are the same... New York City... more than once... historical Boston Commons... Maine, Vermont. In New York City we saw Times Square, Radio City Music Hall, Central Park, Statue of Liberty, Ellis Island, Ground Zero, Bronx Zoo... and so much more... some of these places were scary to visit. To get to the Statue of Liberty we had to hop on a ferry boat. I'm terrified of drowning. We did that twice! Going and coming back. Bronx Zoo is located... would you believe? ... in the Bronx! For our safety, we left at 5 PM. While walking to the subway, we passed two men on the sidewalk... Jay reaches over to me, grabs my arm and whispers loudly, "Mom, don't look now but that man is selling a knife to the other man!" We almost made it out without my children knowing I had taken them to a "bad" neighborhood. I knew there were risks involved. I had faith God would watch over us and faith in my ability to maneuver around in the city safely. :) We saw a skateboarder in Battery Park with his hair up in a purple mohawk and his body painted in orange. He allowed me to take a picture of him with my children. I have that picture scrapbooked! We also saw a street performer dancing with an incredibly flexible woman. He twirled her and bent her in ways I was simply amazed at! Turns out it was a mannequin tied to his legs! It was a sight! We were able to experience four seasons... fall, winter, spring and summer. We were able to experience fall as it should be... cool weather, apple picking, cider and doughnuts, hayrides, corn mazes and beautiful breathtaking scenery. I almost killed myself the first fall we lived in New England. We lived in Connecticut for two years and this is where we saw our first fall. As I was driving myself to work, I was mesmerized by the scenery before me and nearly drove myself off the road several times. Pictures can capture a glimpse of the beauty but until you are fortunate enough to see this first-hand you'll never understand just how magnificent it truly is. Yes! I am! First time ever from a blog too! I am always commenting on and/or sharing posts on FB and Pinterest in hopes of winning some big prize and... till yesterday... zip. Christmas morning I woke to find a message from a friend on a private FB group that someone with my name in the big ol' city I live in won a prize! I jumped out of bed... I was checking FB on my phone... and got on the desktop and lo and behold... there it was! In black and white... weelllll, in print... ummm... OK on the internet! I won the third prize in Simply Betty's Giveaway! I will receive an entire year of free Teen Scene digis! Boy howdy! I love these digis! They are cute! I can't wait to see what they put out in 2013! When he gets home tonight, about 7ish, we plan to celebrate our Christmas. Nina had to work last night... she goes in at 6... and we wanted to celebrate as a family. We will exchange gifts after our turkey dinner. My house smells so yummy! I've got the turkey in the roaster... stuffing, dirty Cajun rice and macaroni and cheese are baking in the oven. Ice cream for dessert. We do Christmas simple. Now Thanksgiving... that's a totally different holiday! I love fall and Thanksgiving... no pressure about gift giving... so I go all out with the meal and desserts. :) Christmas is about celebrating the birth of Christ. I like to keep it simple. I've written twice before about a swap I have with friends over on FB in a private group. We are having a swap based on the alphabet. We are up to the letter C and are doing chickens. I had a blast with this swap! I cannot wait to send my cards out! I've shared three before today... now I am sharing the last four. We are a group of eight. I need to send seven out... later... when the Christmas rush calms down... I'll make my own to keep. :) Besides... I'm not sure I could chose! I love them all! 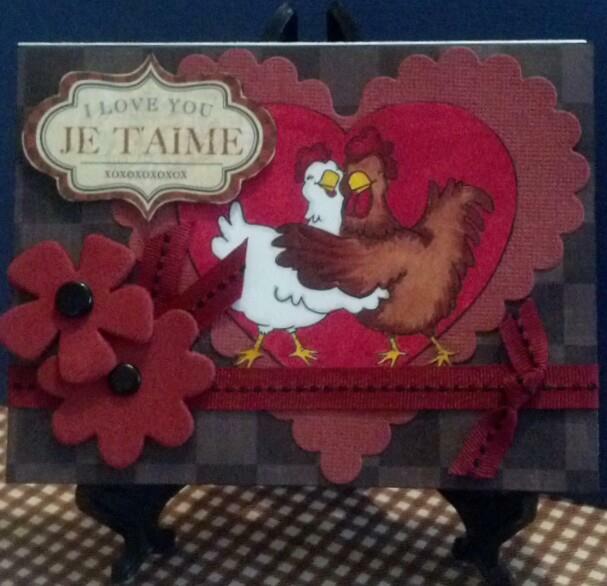 I used Rooster Provincial from Hobby Lobby or Countryside Villa from Michael's paper pads for all these cards. 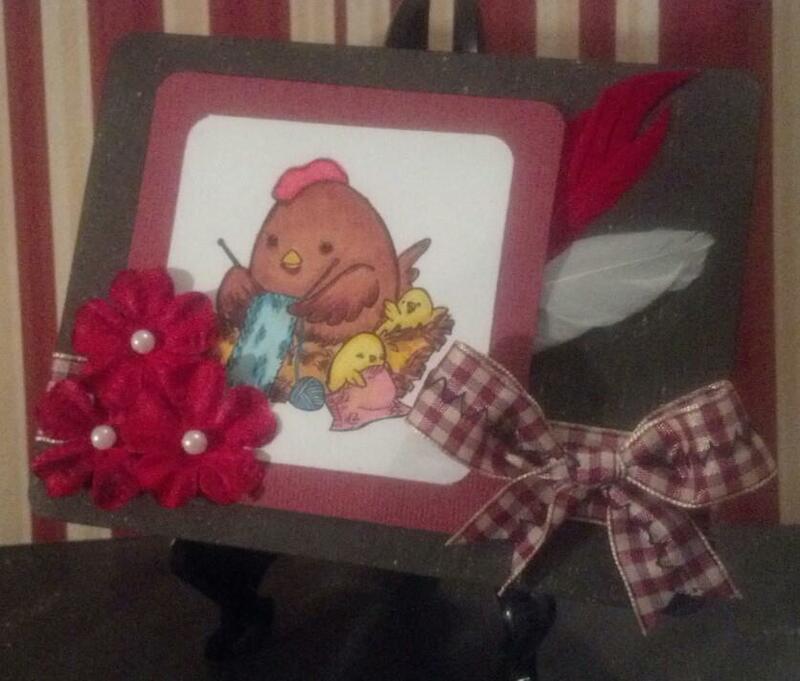 All card stock, ribbon, feathers, flower and twine are from my stash. All of the images were colored with Copics. 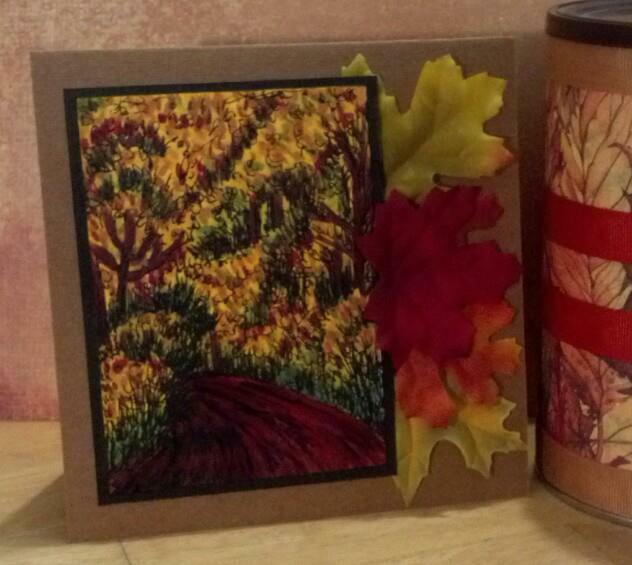 On this first card, I wanted to add a plastic sunflower I have stashed somewhere in my craft room. I became frustrated looking for it... have you seen a previous post called Art Space? I had good reason to become frustrated! :-\ I did remember I had a clear stamp of a sunflower... actually... I have three, one in rubber but that one is large. Sunflower stamps are like coffee / tea stamp sets... I cannot pass them up! Typewriters and phones are two more I have several of! I can't imagine ever having a need for more than one... but I'm getting off the subject. 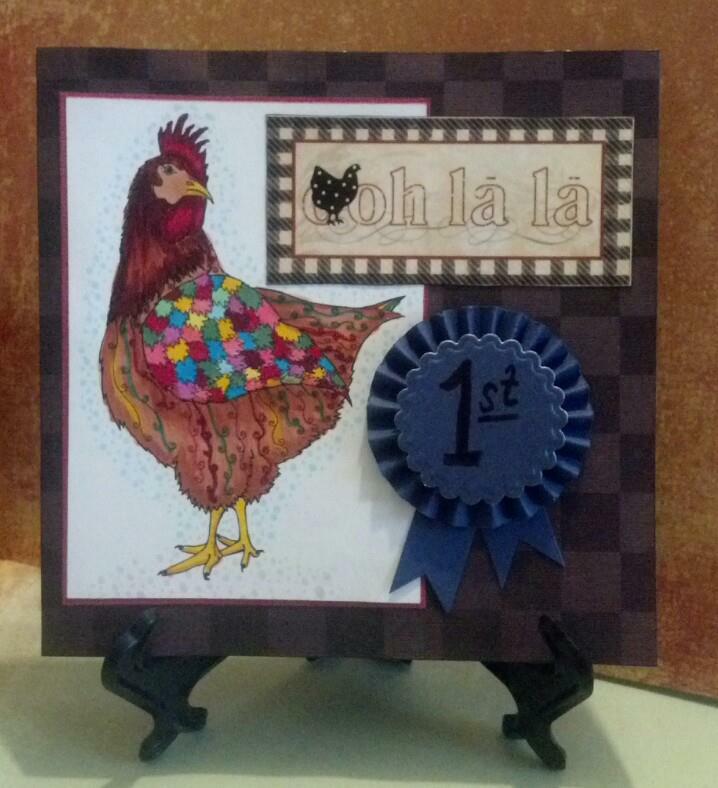 This first one is Little Wood Rooster from Meljen's Designs. I stamped the sunflower stamp three times and did a fussy cut on two. I then layered the three images. I applied Liquid Applique in brown to the center of the flower for added dimension and when I went to dry it... it turned tan! I then went back over it with a dark brown Copic. I liked the feather look so much I repeated it! 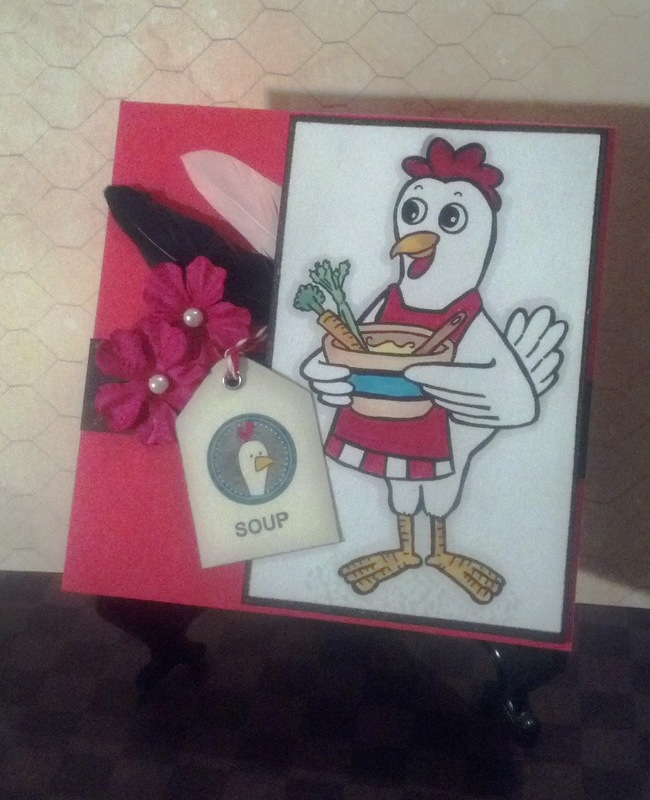 :) The large chicken image is Get Well Soup from Fresh Brewed Designs. The smaller image is Chicken Soup from Raisin Boat. Aren't the feathers fun? This last card is actually made from some printed paper I received long ago from a friend. The entire packet were farm fresh and french kitchen images. I love this rooster head image! I layered several flower pieces I had to create one fluffy flower. Did you forget someone? Need a stocking stuffer? 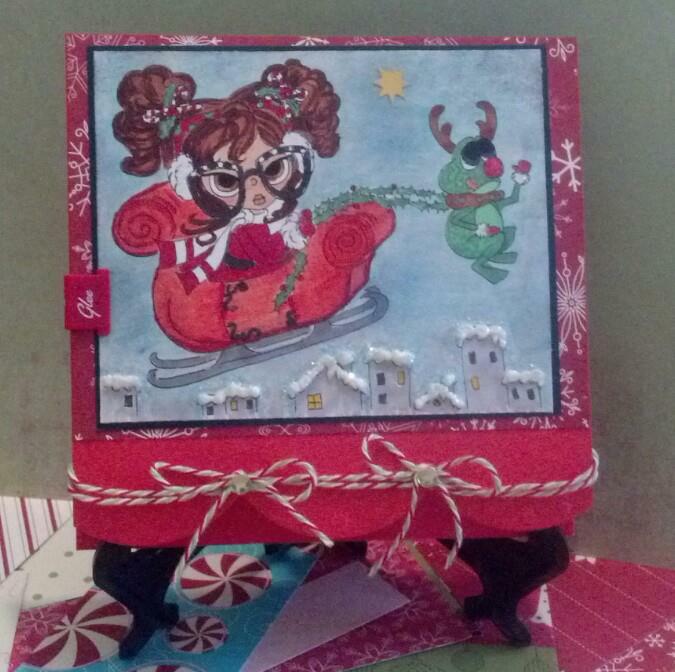 How about a gift certificate for the crafty girl in your life! 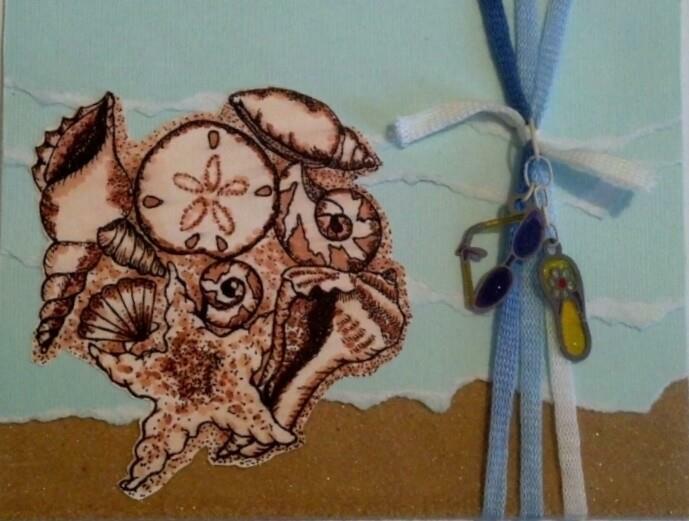 One size fits all... :) You can find these at Scrapbook Stamp Society. I saw this rooster... and she ASKED me to make her into a quilt! She did! I love it! I meant to make the ribbon into a blue ribbon look but well... if you are my age... you know the whole thing about short -term memory loss. I suffer from it... hopeless case! :( Anyway... 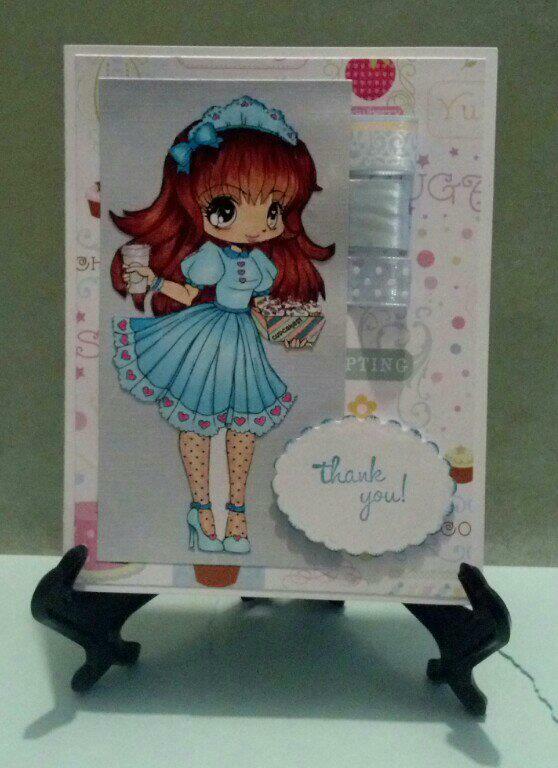 I used Copics for the coloring and Rooster Provincial paper pad from Michael's. 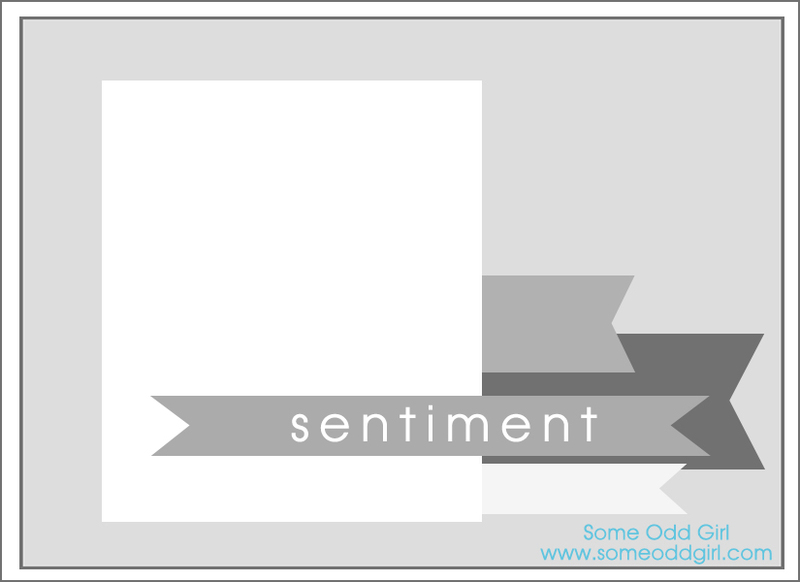 Ribbon and card stock from my stash. Image is from Stitchy Bear Digital Stamps and called Calum Cockrel. Isn't she just wicked awesome?!? Guess what? I was wrong about the deadline again... but in a good way this time! I've already completed the challenge that was due by 6 PM Christmas Day! It was the one I did day before yesterday! Duh! I'll tell you what it is... it's after midnight... 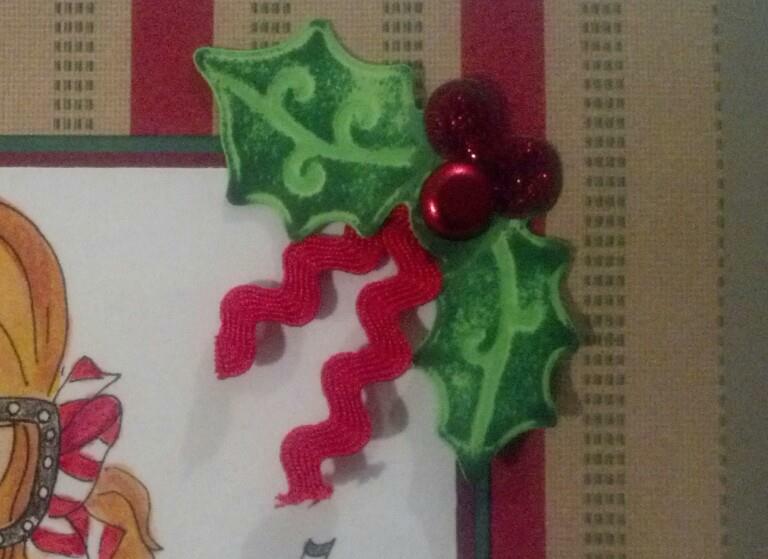 I have stayed up late all week long crafting... getting up early to get ready for the holiday week... I can't remember much of anything... which is OK because after the last deadline I missed... I wrote all the info down on a note pad. All I have to do is go have a look see and I know where I am at. My last post I did was for a challenge with the ABC theme... that's speaking of the challenges... I wrote about having an ABC swap with a group of friends in a private group on FB... and now we are done speaking of challenges. 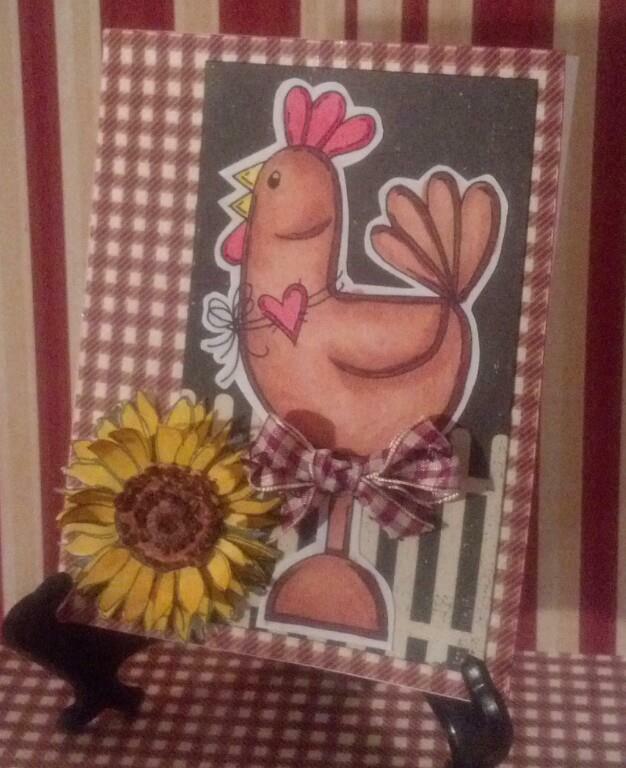 :) We are up to the letter C and are making cards with chickens. I have made six so far and ALL are different... I can't help it! The ideas are flowing out of my ears! Actually... spilling out! I have so many and if I could... I'd ask the girls to do it again when we got to the letter R but that time it would have to be roosters just so I can get all these ideas down on paper... but as I wrote... we're barely at letter C! By the time R gets around... maybe they'd have booted me out of the group! :-\ It wouldn't happen... we've been online friends since about 2004. So anyway... eventually I will show you all the cards but this one I have to show now... I. Have. To! 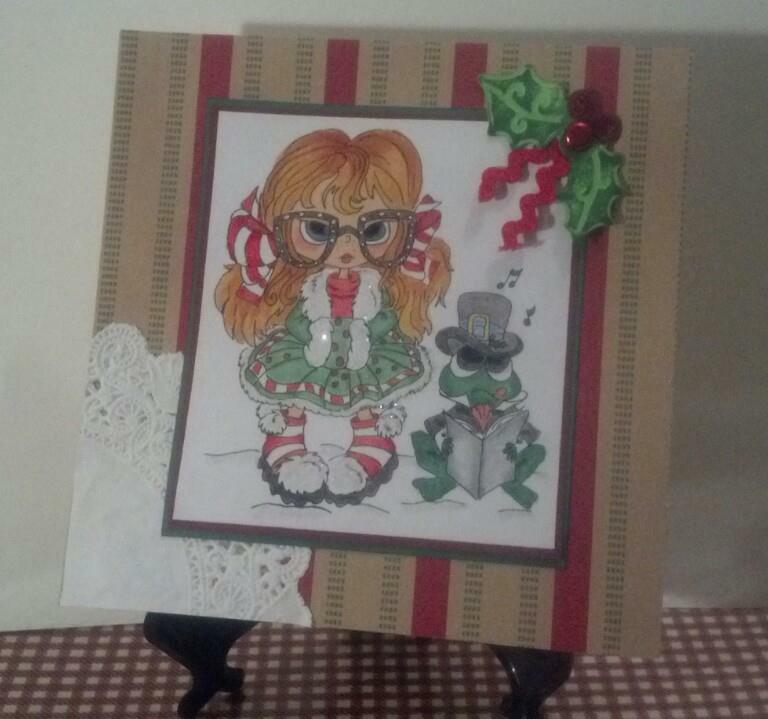 So this card is for an "Anything Goes" challenge over at Meljen's Designs. 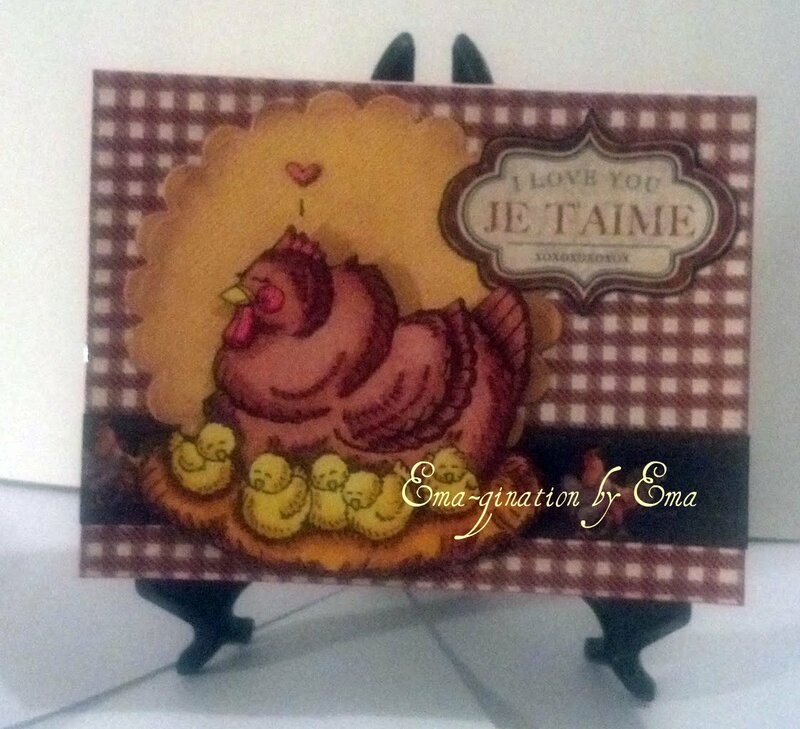 I bought me this little Mother Hen stamp because who doesn't like chickens? 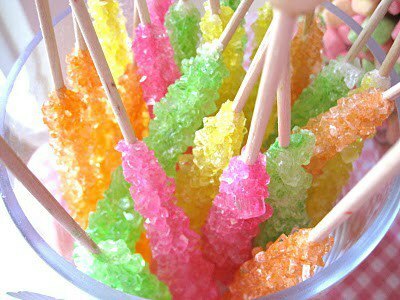 ;) They are tasty! They are multi-tasking! They lay eggs and make a mighty fine meal too... ;) lol I grew up on a farm... I have VIVID memories of seeing chickens running around with their heads cut off but that's a story for another post... :) ... for now, I want to show you this card. I love how it came out! :) I REALLY DO!